But didn’t you hear: FREE on Amazon’s Kdp Select is the new 99 cents! These people have tripped over themselves in that race to the bottom, that race to nowhere, and are offering Amazon Select EXCLUSIVITY on their ‘work’ in exchange for being able to give it away for free. I had heard, but I forgot about it. Largely because it didn’t affect me at the time, since I’ve pulled my one and only self published eBook from all distribution channels over quality concerns. However, I did some more reading and while…wait. Crap. 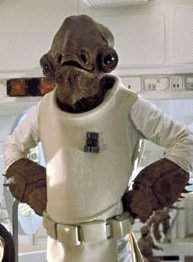 That’s a picture of Admiral Ackbar I just posted over on the right hand side. Damnit, that’s going to give away my entire thesis. Alright, play it cool, maybe no one noticed it. I did some more reading and while it’s a program that doesn’t directly affect me right now, I do have some thoughts. Largely because it plays into a few things that I like to talk about: math, innumeracy, and psychology. First off, what is KDP Select? It’s a new program that eBook self publishers can opt into that allows Amazon Prime members access to their books within the Kindle Owner’s Lending Library program. What is the Lending Library? It’s a new carrot Amazon has offered to lure Kindle owners into Prime membership by offering them the ability to “borrow” free of charge one Kindle book per month from a limited catalog of all titles. It’s a fine benefit, and the one-a-month limit makes a certain amount of sense. Amazon has, in general, provided some fantastic value-added to the Prime membership since it’s initial launch offer of free two-day shipping. We will establish a fund on a monthly basis and you will earn a share of that fund for each of your Digital Books included in the Kindle Owners’ Lending Library Program. Your share will be calculated as the number of times that the Digital Book has been borrowed during the month as a percentage of the number of times all KDP Digital Books have been borrowed, multiplied by the fund amount we establish for that month. This share is your total Royalty for borrows of that Digital Book through the Kindle Owners’ Lending Library Program. For example, if the fund for a particular month is $500,000, your Digital Book is borrowed 1,500 times, and all participating Digital Books are cumulatively borrowed 100,000 times, your Digital Book will earn $7,500 ($500,000 x 1,500/100,000 = $7,500). We will determine in our sole discretion the criteria for determining which borrowing events qualify for this calculation. A maximum of one borrowing per customer will qualify. We may publically announce the top Digital Books borrowed, including the author, publisher, number of borrows and KDP Select fund royalties earned. This is odd explanation for what is a complicated formula to begin with. Basically they look at what percentage of all KDP Select loans your books represent, and you get that same percentage of the pool money. The sample math then shows someone earning $7500 based on two entirely hypothetical numbers. While there’s no point where Amazon states that this is how much you might reasonably expect to earn, I’m rather uncomfortable with them throwing around such a generous number in their hypothetical math. This is some of the initial bait that Amazon is laying down. The next will come at the end of the month. See, December is the first full month for the program, so it’s the first time these loans will pay out. Expect to see some people report some gaudy numbers, as I suspect there are a lot of people taking a wait-and-see approach to this new deal. However, there is a very limited resource at play here. Thanks to the one-a-month limit, the total number of monthly loans has an absolute cap equal to the number of Amazon Prime members who also own a Kindle. This means that, as more writers and books jump into the program, the pool will get diluted. Now, the cap is going up. One of the goals Amazon has in this program is for more Prime members to buy Kindles, and vice versa. More and more Kindles are being bought, many people just got them for Christmas (some, if they got a Fire, also got three months of free Prime membership, so three chances to borrow). The ceiling is rising, but it’s still a ceiling. This creates an interesting situation. First, it means that a participating book is facing wider competition for a slowly growing, finite number of borrowing slots. Second, it means that the same number of borrows, month to month, might produce widely different payout. Let’s say that a lot of people just got a new Kindle Fire for Christmas, and discover the Lending Library in January. This sends the number of borrows up by 20% from Amazon’s math above to 120,000. This means that each borrow is no longer worth a $5 royalty, but now only $4.16. The $4.16 calculation assumes that the pool remains at $500,000. I will give Amazon some credit. When they launched Amazon Studios, they were promising minimum payouts for the first year, but those payouts have actually increased. By the end of 2012 the pool of money for KDP Select may very well be closer to $1,000,000. Or it may still be $500,000. Or the number of downloads may be such that, even if the pool of money does double, the worth of each loan goes down by more than half. Everything is an unknown right now, even how much these payouts will come to in December. I can’t say people won’t make significant money. Amazon can’t say people will. There’s the price you pay for entering the program. You cannot offer the book on Smashwords, have it distributed to the Nook or iBook stores, or sell it directly on your website. Amazon has become your publisher, and only they may distribute your eBook. Additionally, there’s a non-compete clause in there I cannot even begin to understand or speak about, so I instead refer to the KDP Select post over on Writer Beware. It’ll be hard to say what Amazon will consider as “likely to compete commercially,” diminish value, or create confusion until such a time as they invoke this clause. It also has Smashwords, which has a growing stake in the wide distribution of eBooks to multiple sales venues, accusing Amazon of predatory practices. So yes. I started this post with a picture of Admiral Ackbar, largely because I look at this and my only reaction is…It’s a Trap! But honestly, this is another one of those trials of being a writer looking to self publish, right up there with setting your price point and finding the best way to make your book as polished as possible. Many writers will determine this is a good way to promote their books, and many authors will get good promotion out of this program. Many of the authors jumping into this program are offering just one novel, whether a stand-alone or the entrance novel into a series. However, as with any legal agreement, it’s best to know exactly what you’re getting into and what the ramifications are. Especially with that exclusivity clause that I’m certain at least some writers will fall afoul of entirely by accident. Let’s go back to the math for one more interesting, and I stress entirely hypothetical, thought experiment. It’s possible for the pool of money to increase, for an individual author’s readership to increase, but for that writer’s compensation to decrease. Here’s how it works. Let’s use Amazon’s math from above: 1500 borrows for a book out of 100,000 total borrows. Which results in a $7500 payment. Let’s say the number of borrows quadruples, so Amazon moves to double the money available to $1 million. Let’s also say the author improves their borrowing rate by 50%. That means they have 2250 loans out of 400,000 total. This is 0.5625% of all loans, which means the author is now making $5625. In spite of everything going up (overall popularity of the program, payment pool, and number of loans for the author), the author’s compensation goes down 25%. It makes this a gamble. And the paradox here is that the program will be better for early adopters the less popular it is. Hell, in theory if only one person signed up one book he or she would get a cool half million. So be smart, consider the risk versus reward. And if you jump in? I wish you nothing but the best of luck. I’d be thrilled if I’m being unnecessarily pessimistic about this program. But, for now, I write to you firmly from the wait-and-see camp. And keep an eye on Writer Beware in the following months, as there are several self published authors who are experimenting with KDP Select and have promised their experiences to the blog. Here it is, the stand-in contest to fill the void with so many other flash fiction contests taking the week off. Your goal, if you choose to accept it, is to write and post up to 500 words, one of which must be the word below. The contest will close at 8pm Eastern Time (5pm Pacific), at which point I’ll read through the stories and decide on one to be the big winner of the first, last, and only One Off Flashfiction contest. That winner will walk away knowing that no one else will ever equal his or her accomplishment, as I never intend to run this contest again! There are 16 definitions available for the word on dictionary.com, 12 as a noun, 4 as a verb. I’m just asking you to use one of those. And don’t forget your Twitter handle! I wish I’d thought of this earlier and assembled a cookie swap among the writing bloggers, but I’ll do it just for myself this year and perhaps see about expanding it next year. Below is my mom’s recipe for mocha brandy balls, with some modifications I’ve made through trial and error. I’m sure she got the recipe from somewhere, but I don’t know where to credit it. Dissolve coffee in ⅓ cup of boiling water. Allow to cool. Melt chocolate over low heat in saucepan or double boiler, stirring frequently. Remove chocolate from heat. Add wafer crumbs, nuts, syrup, brandy, coffee, and 2 ½ cups of powdered sugar. Chill until workable. Roll into balls and dust with remaining sugar. Put each ball into its own paper cup. Store in an airtight container. Makes several dozen, depending on size of balls. Notes: Chocolate wafer cookies are a real thing, I’ve found them in most larger grocery stores on the cookie and cracker aisle. They’re in a long yellow package, and there are exactly 5 to the ⅓ cup, making measurement easy. If you absolutely can’t find them, I’ve successfully substituted chocolate teddy grahams, or chocolate cat cookies from Trader Joe’s. If the dough is too firm to work, microwave it for 30 seconds at a time, just to make it pliable. I find these get better as they sit, and typically make them 4-5 days in advance of whatever party I’m bringing them to. I find often find the recipe is a little too sweet, even with just semisweet chocolate. The unsweetened (not bittersweet) cuts the massive amounts of sugar nicely. The spiced rum can add a brighter flavor to the recipe, or the chocolate liquor obviously makes the recipe that much more chocolaty. There are a lot of flash fiction contests out there, which is why I don’t run one. But a lot of these contests are taking next week off, so I will run one. Once. It will be the One-Off Flash Fiction Contest. It will be rules light, because that’s what I do. I’ll put up a prompt at noon eastern on Wednesday the 28th, deadline at 8pm, winner announced the next morning. The prize: getting to call yourself the one and only winner ever of the One-Off Flash Fiction Contest. No one else will ever win because it won’t ever happen again, so no one can ever take that away from you. Help spread the news on Twitter with the hashtag #OneOffFlash, and join us here on Wednesday for some writing fun. I’d like to dip my toes into some dangerous waters. Dangerous because I know there are strong emotions around the issue. And dangerous because I’m largely an outsider to the issue. But it’s an issue that’s been floating around various writing blogs, and that I have my own thoughts on: the 99 cent eBook. There’s a recent school of thought that 99 cents is the natural price for a writer trying to break into the market, someone trying to make a name for himself. Some have even suggested it’s the “proper” price of all eBooks. The argument goes that it’s the lowest allowable price, which makes it the lowest investment purchase for a reader while still giving the writer at least some money. It’s also a step above free, which clearly leaves nothing for the writer who has put effort into this work of fiction, and is often viewed by readers as an admission of poor quality (public domain works notwithstanding). I have some problems with the 99 cent price point. Apple did this. Amazon did this. They set 99 cents as the cheapest an item could be, whether in the App or Kindle store, while not being free. This was, in part, to prevent a race-to-the-bottom. With this pricing scheme, two people with competing apps or books can’t leapfrog each other on the race to be the cheapest offering by shaving off two cents at a go. If you want your impulse buyers but still want buyers rather than takers, the floor is 99 cents. These are companies looking to make money too, and while they’re willing to support free apps and books as loss leaders, using their resources of hard drive space (though that’s basically free anymore) and bandwidth, they’re not willing to work out a revenue split on a nickle or penny. And who can blame them, really. It’s easy to forget the middlemen in the modern microtransactional marketplace, to feel that we’re buying directly from developers or writers, but this isn’t the case. If anything, the need for middlemen becomes more important with digital transactions. It protects both the creators and the buyers. But that’s not the point of this post. The point is that, through these decisions of 99 cents as the absolute price point floor, they’ve created a new reality in which 99 cents feels nearly free. And isn’t it? Have you ever paid for something out of your pocket change and had it felt free? Have you ever cashed in your coin jar and felt like the resulting money was somehow a windfall, found money? Inflation has created a modern America where coinage has less of a value than in the past, it’s what was left over after we paid for something. There’s also psychology at play, the same psychology that’s always been at play with prices that end in 99 cents. Going from $99.99 to $100 is, in terms of percentage, a minimalistic increase, but in terms of a human animal predisposed to look for round numbers and thresholds, the difference between “Under $100!” and “Only $100!” is a surprising chasm. So if 99 cents is “Under $1!” and we’ve come to devalue change, doesn’t this price point become essentially free? And if it’s the new free, the new ultimately disposable price point, doesn’t it have the same issues as free always has? Doesn’t it become the mire through which someone has to dig to find the gems, the legitimate loss leader books that will hook you on a new series hidden among the books that have been thrown up in haste and cynicism. I love that the new digital marketplace for goods and ideas has opened a door that never existed before. It’s the idea that literature can be microtransactional. There are now places to buy and sell short stories à la carte, which opens up ways for writers and readers to connect to each other in new ways. By transacting in units of one short story, readers can pick and choose who and what they’re reading. By selling units of one short story, an author can try something new or even, as I’ve discussed before, expand their world for the most curious and devoted of fans. This has also reopened the novella market, traditionally the hardest length of fiction to sell because it has the fewest markets. They’re not long enough for separate publication in the eyes of most traditional print publishers, but they require serialization in a magazine or a lion’s share of an anthology, which asks a lot of the editors of either. However in modern ePublication, length doesn’t matter like it once did. Because there aren’t limited resources, like page numbers, to fight over, and there aren’t super-skinny spines to hide among the novels on store shelves, novellas can stand their own. But with the 99 cent price point for novels, these two markets get squeezed again. There’s no way to go down from 99 cents, so there’s a situation where novels, novellas, and short stories, all works of differing lengths with various expectations, end up lumped together at the same price point. And that’s unfair not just to the short stories and novellas, but to the novels as well. Please note I put both of those in quotes. I don’t ascribe to that theory. I’ve had several instances where my favorite stories in an anthology weren’t the ones I bought it for. Next step up. Novellas. Longer than short stories, requiring more work from the author and often entered into with more expectations from the readers. Since the market place requires prices that step up in whole dollars, the next cheapest price point allowable is $1.99. Step up a dollar again for novels, and you’re at $2.99. Which in my thinking really is the magic number. Not only does $2.99 create space for shorter-form fiction in the marketplace, it’s also an important threshold in Amazon, the point where the self publishing author jumps from a 35% share of the revenue to a 70% share of the revenue. Now, I know that a lot of writers who are hanging out in the 99 cent price point aren’t there for the money. But…they are. If they were there for just the exposure, they’d be pricing things for free. At 99 cents, they’re calling their product something worth paying for, something that they want to see monetary gains from, even if they will be minimal. But the exposure. 99 cents gets you exposure! It’s true that there are a lot of Kindle readers who are willing to buy books at that 99 cent price point without a second thought, who will read authors they wouldn’t have read before because the book was nearly cheap-as-free. There are two problems here. First, there’s already a sampling process within the Kindle Store, one that any author must take full advantage of. Second, exposure only works if the book is worth being exposed to. I know there are stories online of people who have had a lot of success with 99 cent books, who have seen their titles shoot up the charts, and who perhaps even made an appreciable amount of money 35 cents at a time. Not enough to retire on, but perhaps enough to vacation on. And people have successfully offered the first book of a series for 99 cents to get someone hooked. Remember the drug dealers in the old after school (and sometimes during school) specials we used to watch? The first one’s always cheap, get someone hooked, then jack up the price. It’s a legitimate marketing strategy, and some authors have used it with out-of-print back catalog titles of ongoing series. But the trick with exposure: it’s only exposure. It’s not inherently good. It lays you bare and lets people see you for what you are. And if they don’t like what they see, they aren’t going to want to see any more. To put it simply: 99 cents is not a license for bad writing. Why are we willing to pay more for the new Stephen King book? Because it’s a known quantity. We also know that it’s been vetted, edited, revised, and cleaned up. All by professionals. Mr. King didn’t just finish 11/22/63 then stick it on Smashwords the next day. The self published writer looking to make a name on the Kindle store finds himself in a store that also offers King, may even find himself in the same list of search results as a King novel. But he doesn’t have the name, doesn’t have the promise of a professional publishing house, so he uses the only tool in his arsenal: undercutting the price. But just because he’s able to put his book up there for 99 cents, or even $2.99, doesn’t mean that it can be of clearly inferior quality. Because readers will be turned off. The success stories that have come out of authors self publishing on Kindle don’t come from people who have slapped up their Nanowrimo novels and called it a day, they’re from either established writers who are self publishing their rights-reverted back catalog, or from writers who have busted their asses making sure the product they’ve created is as indistinguishable as possible from professionally published novels. Need I remind you, Amanda Hocking eagerly signed a publishing contract rather than staying self published. Any novel presented to the public at large should be worth at least $2.99, because if it’s only worth 99 cents, then the writer is cheating his reading audience, and in turn is really cheating himself because the negative exposure will stick. I learned this first hand with my one venture into self publishing on Kindle when I did put up something that wasn’t worth the $1.99 I was charging for it. Looking at this from another angle: My wife is the fastest reader I know, and even then I’ve never seen her go through a novel in less than four hours. At $2.99 that’s only asking 75 cents per hour of entertainment even for the speediest reader. But it’s also asking for hours of a readers life. This is a contract that goes both ways. There are legitimate uses for 99 cents in the Kindle store. Getting people hooked on a series. Offering books for limited period sales prices. What I don’t agree with is the notion that it’s somehow the “right” price for the self published writer, or any writer, by definition. You as a writer are worth more than that, and if your book isn’t, then it shouldn’t be published to begin with. Is that harsh? Yes. Do I stand by it? Yes. It’s a new market out there. And with any new market, there is going to be some growing time, and some learning time. I suspect (at least I hope) that this 99 cent period is a fad and that the market value for a self published novel ends much higher. Because novels are worth more than that. They are an investment of hundreds (sometimes thousands) of hours of the writer’s time, and still stand as the best ratio of cost-per-time of any entertainment form on the market. The 99 cent price point really devalues all of that. So be worth it, and people will buy, even if the book costs a little more. In what year does A Christmas Story take place? It’s a simple question, one that I thought I knew the answer for when my wife asked it last night during my annual review of a favorite film of mine. I went online to quickly confirm I was right to discover that the question is widely debated with five answers directly supported by the movie. 1937. The issue of Look Magazine that Ralphie sneaks the Red Ryder ad into was the December 21, 1937 edition. However, this is two years before the film adaptation of Wizard of Oz came out. 1939. It explains all the Wizard of Oz references, since that’s the year the movie came out. It’s also directly supported by a calendar barely visible on the wall during one of the dinner scenes. It’s turned to December with the 1st falling on a Friday. That’s 1939. 1940. The decoder pin that Ralphie gets from the Little Orphan Annie show is a model only given out in 1940. 1941. The mother distracts the Old Man by pointing out a game between the Packers and Bears “this Sunday”. The two teams played each other on a Sunday in December in 1941, and not again until 2011. Their previous Sunday December meeting was 1933. 1946. The Sox traded Bullfrog. “Bullfrog” was Bill Dietrich, and the Sox never actually traded him, but they did release him in 1946, albeit in September. Little Orphan Annie was long off the radio by this point. So in what year does A Christmas Story take place? It’s easy to call the above discrepancies continuity errors, and there are several legitimately anachronistic items in the movie. It’s to be expected of a film put together on a $4 million budget that was never intended to be an enduring holiday classic. I choose a more charitable view. So let’s chalk it up to a form of everyone’s favorite narrative style, the unreliable narrator. It’s not typically what we think as an unreliable narrator, but what narrator is more unreliable than someone trying to remember his childhood? This movie is clearly the memories of several Christmases fused together, whether intentionally or accidentally, supplemented with other memories from Jean Shepherd’s essays, and all time shifted as Shepherd was born about a decade earlier than Ralphie would have been. Thus the movie takes place in no specific year, and makes a point of not listing a specific year. Instead, it takes place in a childhood within an idealized world, where nothing that happens outside a young boy’s narrow perspective matters. It’s this timelessness that allows it to still resonate, and that makes the “what year” question ultimately futile, and perhaps even counter-productive. Memories are funny things. They exaggerate, they blur together, they take on lives of their own. We see all of this, everything is the heightened realism of childhood experiences. The line to see Santa goes on forever, the weird kid at the end of it is…really damn weird. There’s a grown-up earnestness to Ralphie that comes from being the younger version of the narrator. It’s part of the charm of the movie, and what keeps people coming back to it, even if they have no nostalgic connection to the era. Another example of unreliable narrator via cloudy memories? How I Met Your Mother. While there are points and episodes where the adult-Ted-relating-these-stories narrative falls down, there are those episodes where the writers have used this structure with great effect. Ted’s brief fling with a girl only referred to as “Blah Blah” by the characters, as older Ted can’t remember her name. Getting two stories of Lily being mad with Barney conflated, not remembering that one happened when she was pregnant and the other a year before. Not being able to remember the exact year for the Goat Story. This is all the unreliable narrator trying to pull memories out and getting them just not quite right. We never remember things quite right, except for those people blessed (cursed?) eidetic memory or hyperthymesia. Except, it seems, in stories. Our fictional characters frequently remember the past clearly, lucidly, with no hiccups or faults of memory. This isn’t the way the human brain works. We are all unreliable narrators of our own past, typically because we paint ourselves with our own heroic tendencies or worst neuroses. Always remember this. Never forget this. Especially with a first person narration. Even if the story isn’t intended to have an unreliable narrator, in one way or another it still will. I started this post not with a movie poster, as I typically do for Writer Reviews, but with a Dali painting. 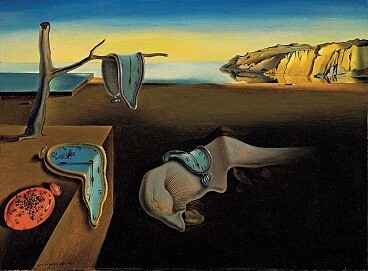 Most of you probably recognize it, many likely by name: The Persistence of Memory. It’s surrealist, certainly, but melting clocks is perhaps one of the best metaphors I’ve seen for how the human memory actually works. Things distort, they blur together, they’re not quite right. Remember that when your characters are remembering anything.